On Paros students stay in the Aegean Center's single studio apartments (one student to an apartment) with private bathroom and small kitchen. Sheets, towels and basic kitchen gear are supplied. We believe it is important for students to have their own apartments in Greece and is the reason we have been providing single accommodations for the past 37 years. To the best of our knowledge we are the only program that provides single efficiency accommodations to their students as a matter of course. Double apartments can be arranged. A few minutes walk from the Center students live in individual studio apartments. 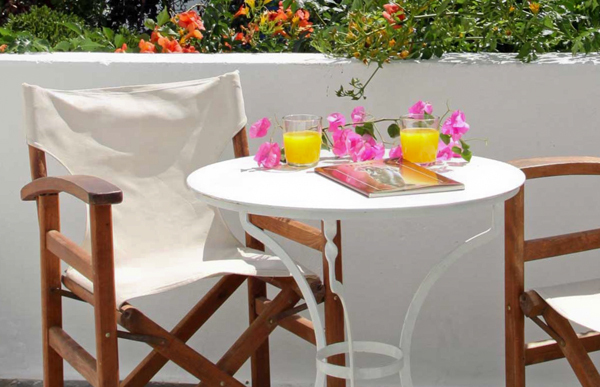 These units are grouped in a garden setting within the labyrinth streets of Parikia. They are white washed to blend with island architecture, surrounded by trees and flowering plants. Each apartment has a simple kitchen, with utensils, stove and refrigerator, a heating unit and wifi. They each have a private bathroom. Maid service and fresh linens are supplied once a week. The proximity to the Center makes it easy to dash home for lunch but the area is well supplied with charming cafes and tavernas which offer high quality meals, well prepared with fresh ingredients. Greek food is wholesome, healthy and moderately priced. Students often prepare meals together and share costs and cooking expertise. Parikia is a traditional island village, built for pedestrians who stroll on cobblestones streets through market streets and neighborhoods. The lack of advertising and car traffic make it a peaceful and calming environment. In Italy we stay at the lovely 16th century Villa Rospigliosi just outside the Tuscan city of Pistoia nestled in the foothills of the Apennines. At the villa there are two students per a room. In the larger rooms sometime there will be three per room. 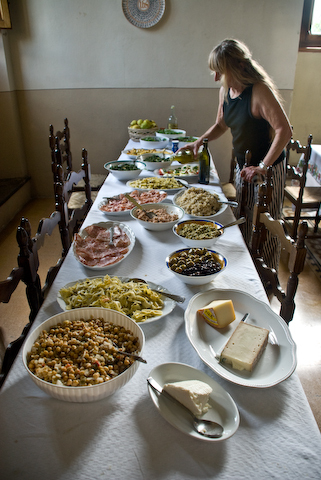 While at the villa we share beautiful meals together in the evening and a simple breakfast is also provided.